Awesome is awesome . . . 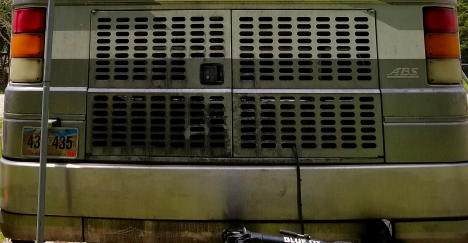 I was outside working on cleaning the rig by about 11:30 this morning, but it took longer than I had figured, due to the fact that it took longer to get all the encrusted oily grime off the rear of the rig than I thought. But Awesome is awesome for cutting through heavy grease and grime. And it’s shiny too. It just took a while. And by 2:30 I had done the rear and the passenger side of the rig, using Black Magic Wash/Wax. Turned out to look pretty good. Beyond the nicks and scrapes the big problem with the rig’s 19 year old paint job is the fact that the Clear Coat finish is slowly peeling off in spots, making the area look like it’s sunburned and peeling. The pressure washer will clean of f these spots, but it will continue to peel back from there. My research says that there is no way to remove the clear coat without removing the paint underneath. And I’m just not sure I want to spend $10,000 to $20,000 on a new paint job for an almost 20 year old coach. But I’m thinking about it. But by 2:30 I was pooped. I plan on finishing up with the front and driver’s side tomorrow afternoon after I get home from work. But, as usual, we’ll see how it goes. 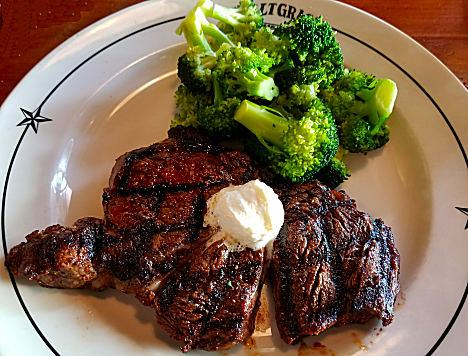 After 3 hours out in the hot sun, I decided that I deserved a steak, so about 3pm Jan and I headed up to Webster to eat at Saltgrass Steakhouse. On the way we were debating, Longhorn or Saltgrass? 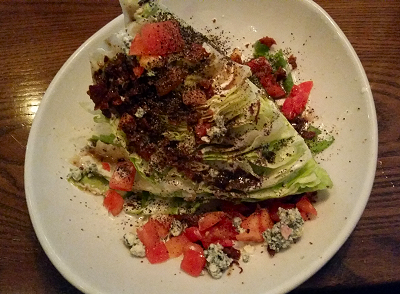 But Saltgrass won out due to their fantastic Wedge Salad. while I got my usual Pat’s Ribeye, also with the Broccoli. Well worth 3 hours in the hot sun. 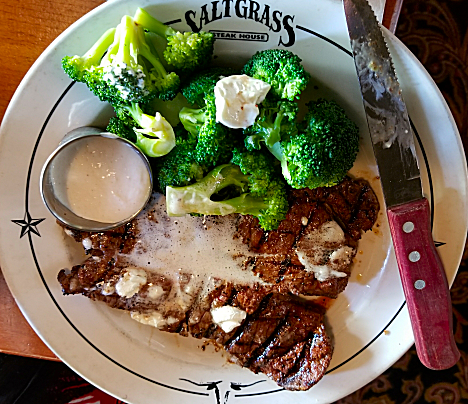 We’ve always been impressed by the quality of the steaks we get at Saltgrass, and a couple of years we found out why. We were eating at one of the Claimjumper restaurants out in Las Vegas and I compliemented our waiter about how good the steak was, and he told us what the secret was. Claimjumper is one of the 40+ restaurant chains owned by Tilman Fertitia and Landry’s. Among others are Morton’s, McCormick & Schmick’s, and a couple of other high-end steakhouse chains. But all the Landry’s restaurants get the same quality meat from the same suppliers. It’s apparently cheaper to do it that way rather than have the different restaurants getting different meat from different suppliers. Make sense, and good eating for us. Coming home we stopped off at the new Dollar General on FM646 to pick up more Awesome since we were running low. Several of our readers have ordered the SoundBar that we recently installed, and are just as happy with theirs as we are with ours. So if you’re having problems with the sound levels on your TV, check it out. I’m still hanging in there with my Duolingo Spanish lessons, having not missed earning my 30 points (2 or 3 lessons depending on how they’re scored), for 157 days straight. There are 61 lessons, covering everything from Starting Basics, to Vocabulary, Clothing, Animals, Food, Occupations, Adverbs, Numbers, etc., with each lesson having multiple levels (don’t really know how many) of increasing difficulty. After a little confusion on how to proceed, (the program is no real help), I decided to just run through each lesson at Level 1, then start over with Level 2, etc. At this point I’m working on the 3rd Level of Lesson 9. One thing noticeable about Level 3 lessons is that now you get less help. On level 1 and 2, when you are asked to translate a sentence to/from Spanish, you were given a list of words from which to pick the correct ones. However now you’re just on your own. You have to translate from scratch.